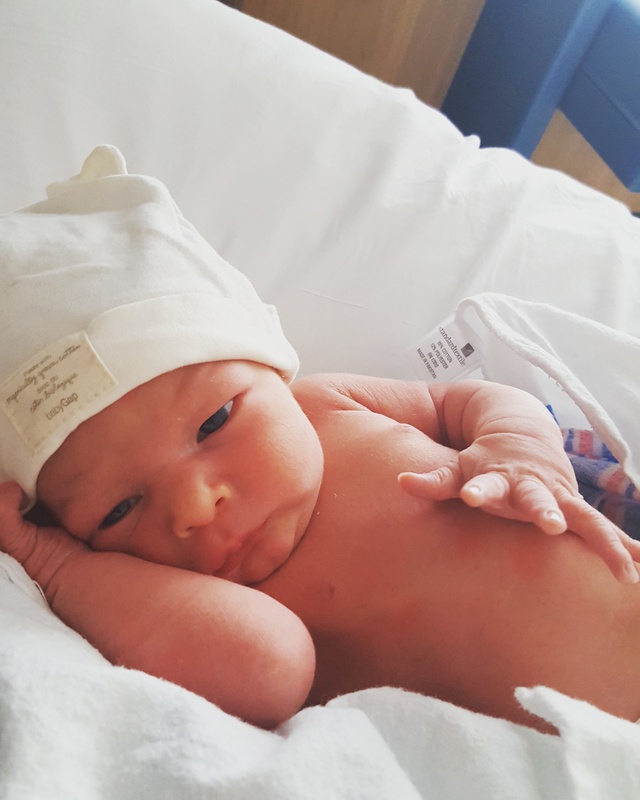 Jack was born at 38 weeks 4 days gestation, and in true Jack fashion – wanted to make his entrance into the world one to remember. The day before Jack’s birth I was a ticking time bomb. I literally spent the entire day sobbing. My mom called me, I sobbed. Dave called me from work, I sobbed. Jack had dropped into position at 31 weeks and by this point I was having the “I’m done with pregnancy” feeling many Mom’s experience in their third trimester. 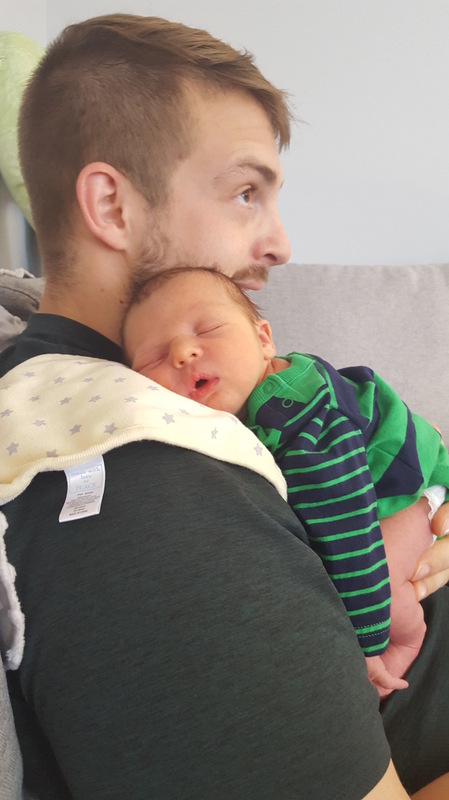 Although I had been uncomfortable for weeks leading up to Jack’s birth, I had not experienced such a rush of uncontrollable emotions – thankfully Louie was around to lick up all my tears before I drowned in them. That afternoon Dave decided to lift my spirits by treating me to what would be our last date-night as “just us two”. We polished off too many servings of all-you-can-eat vegetarian sushi and made our way to Canadian Tire to stock up on some final items before Jack arrived. It appears all the sushi left little room for Jack because as soon as I stepped out of the car I felt a pop in my abdomen. I turned to Dave to tell him something felt wrong (seriously, I thought my bladder exploded) but before I could get the words out – gushes and gushes of water began pouring out of me in the middle of the parking lot. Side note: this dramatic gush only happens in about 10% of pregnancies. Two 15 year old Canadian Tire employees looked at me with fear and horror in their eyes – I began laughing uncontrollably – super clean Dave grabbed whatever towels/blankets he could find in his car and lined his front seat before loading me in. Off to the hospital we went! 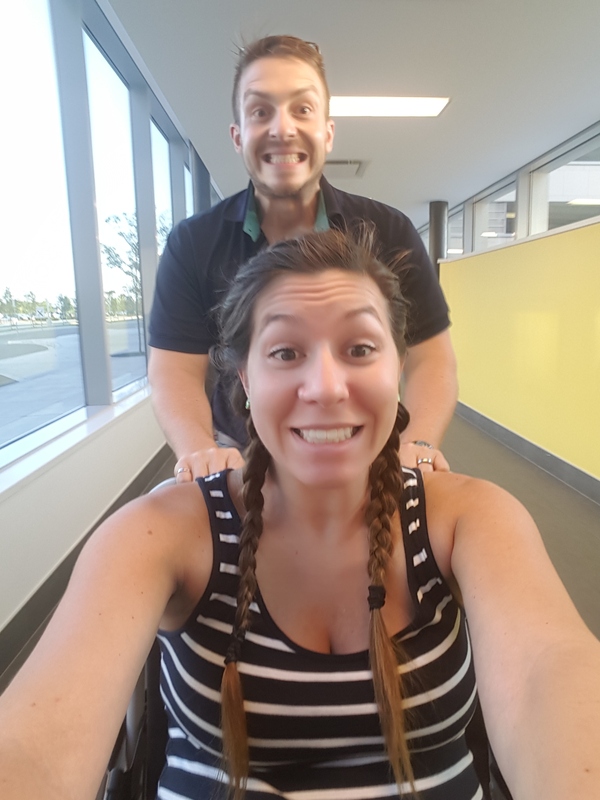 This is how we arrived at the hospital – I was pre-contractions – Dave was convinced I was a rockstar – we had no idea what kind of agony I was about to undergo. Since I wasn’t contracting, the hospital sent me home and told me to return when my contractions were four minutes apart. Within one hour, my contractions were four minutes apart – and let me tell you – contractions = not fun. I laboured at home for 6 hours before I found myself vomiting on our front lawn from pain. It would be a total of 17 hours of labour and one hour of pushing before we would meet the baby boy who had been living in my belly. 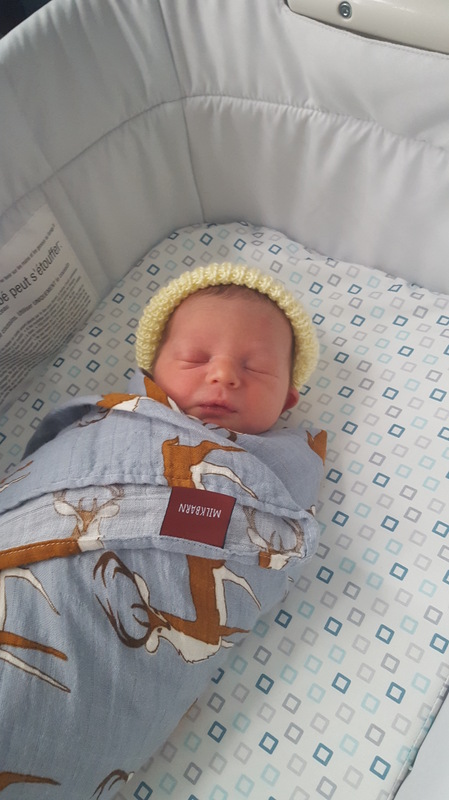 Since the arrival of Jack my heart has exploded with love in more ways than I can imagine. I’ve become even more obsessed with Dave, as I watch him transition into the most incredible father. This man was literally rubbing chapstick on my lips and giving me sips of water between each pushing cycle, he’s changed 99% of our sons diapers, and he’s up with me each and every night to help me feed our especially sleepy baby. We are so thankful for all of the support extended to us during our pregnancy and now, with the arrival of Jack. We cannot wait to share this new adventure in our lives with you. 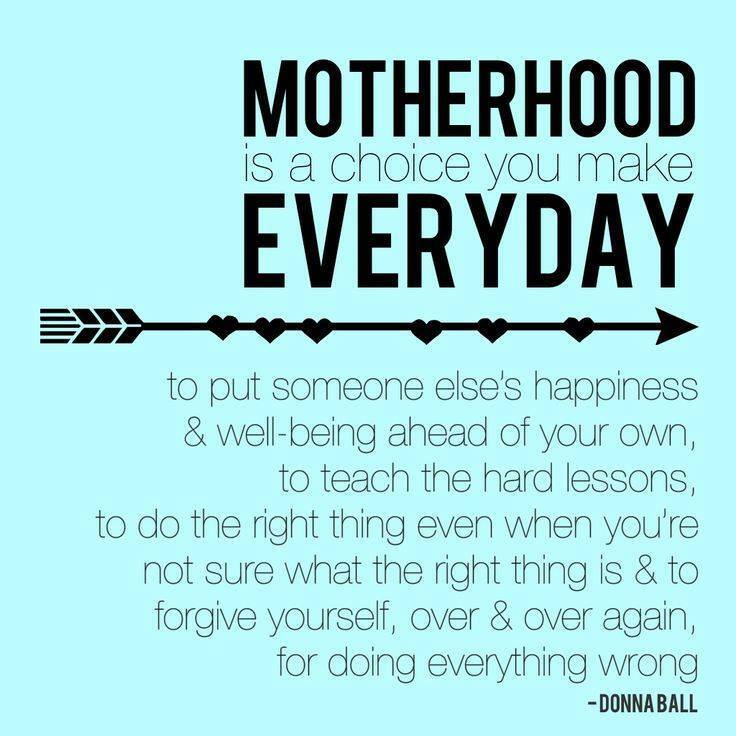 Before I became a parent, I had certain ideas of what kind of a mother I wanted to be. Those ideas were fairly vague initially, but nonetheless I had a list as long as my arm of things that I knew I would NEVER do. I wasn’t going to be THAT mum. 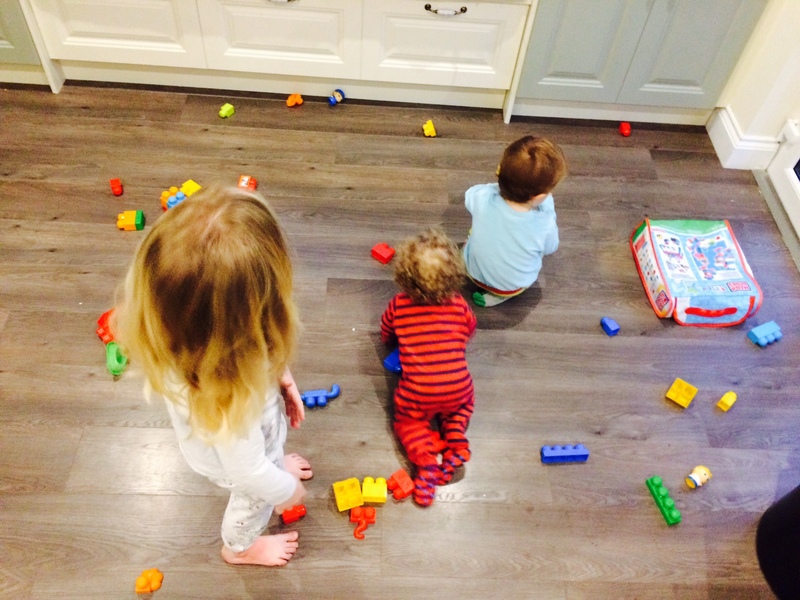 I wasn’t going to be a slave to my kids. Nope. Not me. There was going to be rules and those rules would be followed. So here are some of those things that were on my list of things I wouldn’t do. Give in to their begging for sweets. Not going to happen. I will not be blackmailed by a 3 foot Tyrant! Cry all you want. You think you’re persistent? Guess whom you got that from! That’s right! Follow you around the house bowl and spoon in hand trying to feed you. If you are hungry, you’ll eat sitting down at the table like a normal person! Else, you go hungry. Get drawn into your fashion allures and the whole circus around it. You are 3 years old. You will bloody well wear what I picked out for you! Co-Sleeping. What do you think I bought that cot for? That’s where you will sleep. That’s what the book says. Cook more than one dinner. Are you high? You will eat what everyone else is eating. You get what you get and you don’t get upset. Isn’t that what they teach in school? Molly-coddle you past the age of, let’s say, 5? That’s the cut off. After that I have expectations of self-sufficiency. Maybe you could get yourself a part-time job or something. …..and then I had kids. And that’s when everything changed. My world was turned upside down. Theory met reality. The more kids came along, the more the rules went out the window. The more I started free styling. Partly by choice. Partly by necessity. Did I say I wasn’t going to give into your begging? Go on. Just say “Pleeeeeeeeeeease” again with the cute face and that big smile of yours. I know you are trying so hard to win me over. You know how to play me and you know you have me wrapped around your little finger. I guess in the perseverance competition you win hands down. And yes, I have run after my baby, bowl and spoon in hand, when he just refused to sit in his high chair. We all know that food equals sleep. The more he eats the longer he will sleep. At least in theory. So Mother will do what she needs to do to get that food into him. Fashion allures? Well, unless it has Minions, Batman or Turtles on it, the boy child won’t wear it. He has his own ideas of what he likes and how he wants to look. I have tried to be persistent and enforce that what I say goes, but another very important lesson in the parenting game is “Pick your battles”. I am not going to get upset (again) or upset the child over a silly T-shirt. Today he has chosen to wear all 3 of them. Batman, Minions and Turtles. Who am I to argue with that. Co-Sleeping. When I started co-sleeping with my eldest child, I explained to him, that he needed to sleep by himself like a big boy. His reply to me was “But, Mama, you don’t sleep alone!” Good point, and so well made. That got me thinking. No-one likes sleeping alone. We have co-slept with all of our children. By choice. Then choice became habit. While there are days where I wish we had our bed to ourselves and that one of us wouldn’t always end up in the spare room or on the floor, I know this is for a short time…..relatively short time. I mean it’s been 5 years give or take. But this isn’t going to last forever and I know that the kids sleep peacefully and happy and will (hopefully) grow up to feel secure and loved and close to both parents. I mollycoddle all of my kids. Mum-turned-Slave will do everything a lot for them. I will stand outside the shower, holding the towel for my 9-year-old. I will make sure his hair is brushed and that he changes his socks. I will clean up after all my kids and do their jobs for them. I know. Sometimes it’s just easier. Sometimes I get a fit of “This is it!” and “Things are going to change around here!”… Tomorrow. Tomorrow I’ll start putting my foot down. 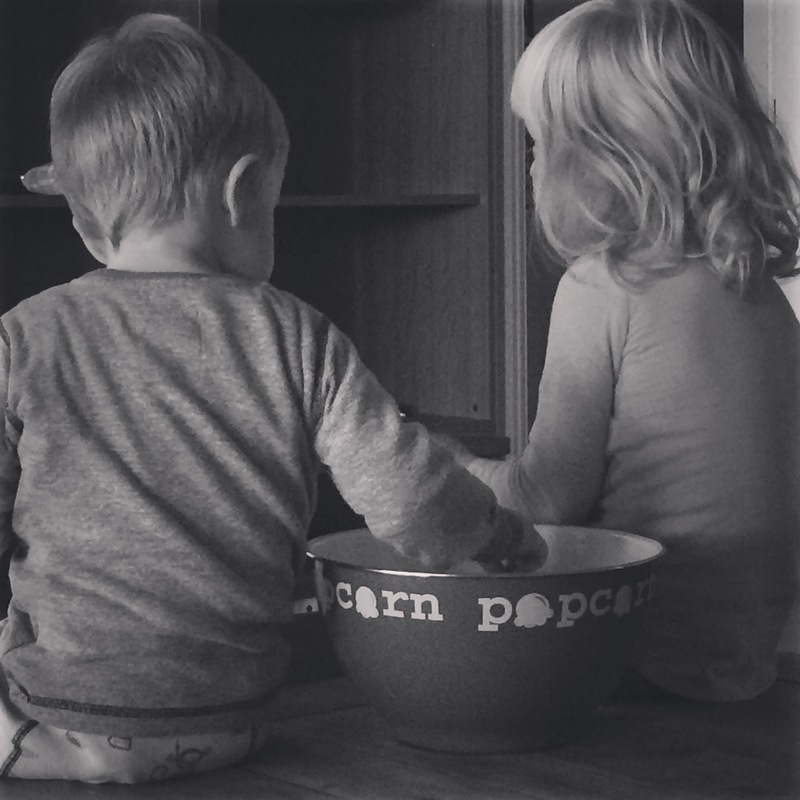 Maybe the things all critics and I think of as parenting mistakes aren’t really ‘mistakes’. Maybe they are a chance to learn to trust ourselves, to trust our instincts and to do what we feel is right at any particular point in time and enjoy riding the waves of parenting. Without the need to constantly second guess ourselves. Everything we do, we do by choice. It is OK to back down from the society-imposed or self-imposed parenting expectations because we know what is best for us, for our family and our children. No-one else knows what we know. No-one else knows our children like we do. No-one else is walking in our shoes. All that matters is that we care about our children and that is why we walk the extra mile bent over backwards to make sure we give them all they need…..and much, much more. What are the things you said you would never do and have done when you became a parent? I am a thirty-something parent and lifestyle blogger passionate about parenting (fueled by wine & coffee), art, DIY and interior design. I’ve four children aged 1, 3, 5 and 9. Recently having gone through a career transition from Customer Service Manager in a multinational company to family manager, I am looking for a new sense of presence, possibility, and creativity. I am the “Queen of my Castle” riding the waves of parenting and I write about stuff that stirs our motherly souls while trying to survive life that’s never boring (or relaxing for that matter), with 4 kids running circles around me. Embrace yourself for tales of toddlers, tantrums & triumphs as well as the joys and frustrations of parenting.